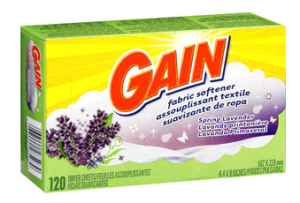 Free Gain Dryer Sheets | A Savings WOW! – It will direct you to the Walmart website. Make sure you use the link that’s opened up to purchase your Gain dryer sheets since it has a tracking link to record your cashback-eligible purchase. – Search for the “Gain dryer sheets” in 105 or 120 sheet cartons priced at $4.88. There are three carton options to choose from: ‘Freshlock Apple Mango Tango’, ‘Freshlock Island Fresh’ or ‘Spring Lavender’. – Within 30-90 days the $5.50 should turn payable and can be credited straight to your checking or PayPal account. Alternativley you could opt to be paid in an Amazon.com Gift Certificate, which with its 5% bonus on top would mean you’d get $5.77 instead of $5.50.